Holiday themed episodes are a teen TV staple and it tends to be when all the juiciest stuff takes place with hookups, breakups, fractured families and other DRAMATIC things. Emotions are heightened and there is often pressure to make these occasions special so of course multiple obstacles spring up to distract and disrupt the preparation of the huge dinner. 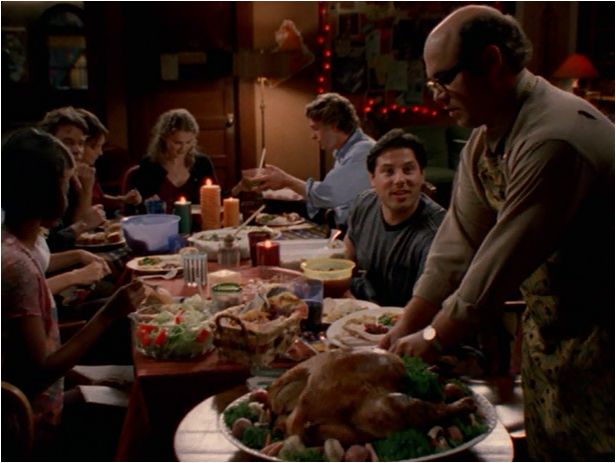 Felicity is no different and in the season 1 Thanksgiving episode (called “Thanksgiving“) everyone ends up at the college dorm for dinner and no matter what drama has preceded there is always some kind of meal resolution and togetherness at the end. And it all looks so delightful. What I really want to talk about (as the title of this post suggests) is Felicity’s hair. Long before she chopped it all off my favorite (so far) Felicity hair moment came courtesy of “Thanksgiving” as she ends up frantically making out with Noel in the bathroom after they’ve had a fight. Noel has been a jerk since his girlfriend Hannah showed up and all the tension boils over into this crazy passionate smooch in the guys’ bathroom. Post kiss Felicity’s majestic tangled hair represents her frazzled thoughts and she doesn’t hide her anxiety well. Felicity is a pretty in control person most of the time and prior to this her only impulsive decision was coming to New York in the first place. As with Halloween, Felicity’s hair is used for maximum effect to show us her complicated boy related dramaz. Except this time it is Noel and not Ben causing these feelings. There is a reason why this shot was my cover photo on Twitter for an age. Here’s another for the simple reason that I love this very similar shot. The sweat pants and sweatshirt combo really pulls the whole look together (PS Ben please burn that hideous pleather looking jacket). Later on she manages to regain some control over both her hair and mouth; we end with the group meal that once again emphasizes friends as family (although Elena’s dad does show up) in the traditional way Thanksgiving episodes tend to play out. It is such a makeshift event that the more people show up the more they have to throw things together which is why Ben is using a plastic fork and Julie has a metal one. For more Thanksgiving Rewinds check out this Dawson’s Creek one here.